I know, it really sounds like I am boasting… sorry! But you too can make a chicken noodle soup that is more delicious than you can imagine. There are a few old time secrets that can turn a good soup into one that makes the angels sing. And I can’t wait to share them with you. An astrick (*) notes tips to a better soup. 4-5 lbs. chicken backs, wings, necks and thighs with skin (any combo) A turkey or a couple of chicken carcasses can be used. When using chicken carcass, add additional chicken pieces such as backs or wings. Put chicken and water in a very large pot over medium heat. Add mirepoix, salt and peppercorns. Bring pot to a simmer, DO NOT BOIL. Skim scum off the top of soup as it develops. *This is a very important step- it will give you a clearer soup. Simmer for 2 hours uncovered. In a separate large pot, bring water to boil, add salt. Cook thin egg noodles according to package directions. Drain and set aside. Using a “spider”, or large slotted spoon scoop out all chicken and vegetables into a large bowl and then discard. Make sure you get it all. * Do not use these veggies and chicken when serving soup, they have given all of their flavor to the broth. Taste broth. *If needed add bullion. Be bold! You should have a very full bodied, chicken broth. Bring soup back to a simmer and add chopped onion, carrots and celery. *Using new veggies gives a second layer of fresh veggie flavor, and taste delicious to eat in your soup. You can also add boneless chicken and cook in broth at this time. Simmer for 20-30 minutes. Remove chicken when fully cooked and set aside to cool. Add potatoes, and cook until tender 15-20 minutes. While potatoes are cooking cube chicken. When potatoes are tender add chicken and 3 TBS minced parsley and simmer for 5 minutes. *Using fresh parsley at the very end of cooking enhances the fresh flavor. Add noodles (as much as you like in your soup) to a wide soup bowl. Ladle hot soup over noodles. *Always keep the noodles and soup separate. If combined the noodles get soggy. This makes a huge difference in the taste of the soup. 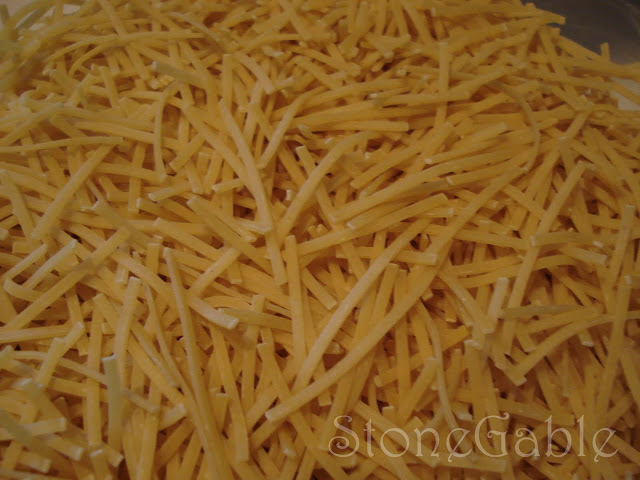 When refrigerating, keep soup and noodles in separate containers. When ready to serve, reheat soup until piping hot and add to cold noodles. My grandmother taught me how to make this soup. I don’t have a recipe, but learned by wathcing and doing. This is not rocket science, so relax and enjoy the process. A little less of this or more of that will change the flavor, but it should still be delicious! Note: I also make this broth for Matzo Ball Soup, Italian Wedding Soup and as stock to freeze and keep on hand. Looking forward to making chicken noodle soup today. Having snow shower all morning. Perfect day for soup. Thank you for sharing this recipe. A perfect day to make soup, Britta! You always have the best yummies! Thank you for sharing the recipe and directions, this soup looks delicious! This is a soup loving household, so I’m looking forward to making this! i have never considered keeping the noodles separate so they don’t end up mushy. What a great idea! This “recipe” sounds wonderful. Is there a printable version? Sorry, you will have to cut and past. 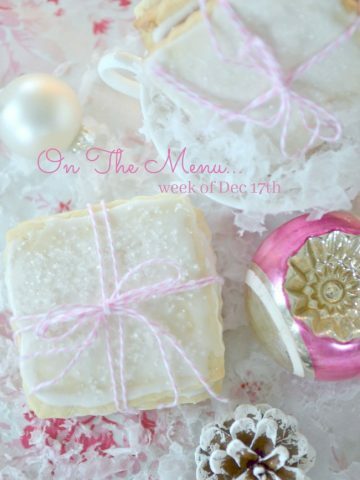 It was a very early recipe in my blogging life! I couldn’t agree with you more. If you’re going to put the noodle in the broth you may as well open a can and have mushy noodles. I usually make my stock in my crockpot with using a “soup sock” (Amazon). It’s so easy and such a time saver. Thanks for sharing your Nani’s delicious recipes! I made this soup today and it is the best chicken noodle soup! We have the flu and bronchitis going through our home and this soup hit the spot for everyone! So glad you liked it! I really believe chicken noodle soup helps illness like cold and the flu! Hi Yvonne, I made this soup when I saw your article about two weeks ago. It is truly delicious. Lots of compliments. Just wanted to tell you I started this soup after work tonight and the house smells delicious! Might have to finish tomorrow though due to the hour. Yvonne, I will surely make this soup!! I just made your Stonegable Vegetable soup this week and I even added the turnips like your said. I have to tell you that I absolutely hate turnips, but I put them in anyway. It is the best soup vegetable soup that I’ve ever made. Thank you so much for the recipe. I’m just sorry that it has taken me so long to make it. I know it will be a keeper in our house. I’m also excited to make this chicken noodle soup, it sounds amazing. I too make my soup with a pasta stock pot with a strainer inside. The strainer makes it so easy to lift up the meat and vegetables that you want to discard. I tilt the strainer on top of the stock pot and let it drain, then dump all the contents out. I love your tips and appreciate all your tips and tricks. They have taught me a lot about decorating and entertaining. Thanks so much! Oh I can’t wait to make this for my family! It looks amazing! Can not wait to try the soup. I just found a new chicken soup recipe! I just made your roasted chickens tonight. Next will be the soup! Can’t wait to make this. Yeah, it is fall at last. Temperatures will be in the 60s next week, time to make soup. This looks like am awesome recipe, and I cant air to make it. Thank you Yvonne. You always get me excited for the change of seasons with your decorating and cooking ideas. I especially want to thank you on your advice on reading Proverbs. I have started. We missed the class on Proverbs at our Chuch because we are in one on a study of the minor prophets. God bless and thank you for your spiritual encouragement. Sorry for the fat fingered typos…. Doing this on an iPad and in a hurry. But, I don’t see any of the “*” to which you were referring to make it a SPECIAL soup!? Oh This soup sounds and looks wonderful! Can’t wait to try it. Thank you! Love your Stone Gables page, but I find that I become so totally engrossed in surfing (because one of your amazing ideas or projects always leads to another and another, etc.) that I finally look up at the clock and wonder where the past few hours went! Please keep up the amazing work. Now to the subject I started to comment on in the first place: You believe your chicken noodle soup is the best. We have something in common – I believe MINE is the best! 🙂 Actually, our methods are very similar, although I have never used a recipe for mine. After years of trial and error, I finally hit on the perfect (for me) combination of ingredients/herbs/seasonings and have stuck with that ever since. I just wanted to share with you a tip my mother taught me when I first began cooking as a little girl. Bring the liquid to a boil before dropping the chicken in and VOILA! No scum and no wasted time trying to skim the yucky mess of the top of the soup. Wow! What a great tip, Bev! Thanks so so much! An easy way to strain chicken and mirepoix before continuing is to cook in a spaghetti pot with strainer. So much easier. Are you using old fashioned table salt or Kosher ? Thank you. You can use either, GG. I usually use Kosher. You are so right…this is by far the best chicken soup ever!!!! I’d stopped making it because I was tired of being disappointed. I did one thing differently than you do. I lined a colander with cheesecloth, put it over another pot to drain out the veggies and chicken bones. Once in a while, not often though, I’d find a tiny bone shard. So the cheesecloth puts an end to that. And it’s easy to wrap up to dispose of. Thanks so much for the best recipe. I have a couple of containers for our freezer and some to share with elderly….well more elderly than me….friends. Hi Dorothy! My older post don’t have the printable recipe card my new ones do. You will have to cut and paste the recipe to a word document. Sorry! 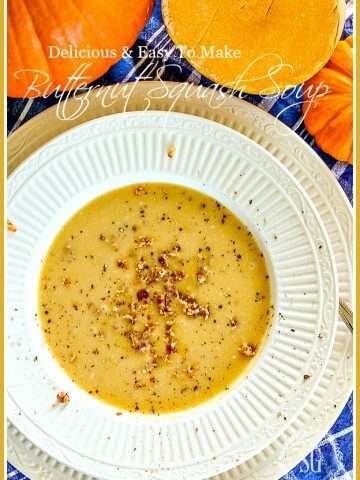 My newer soup recipes have a recipe card you can print. The older recipes can be cut and pasted to a word document and then printed. Hope this helps! I just made your chicken noodle soup last Tuesday! My family loved it. This is deffinately a keeper. Thanks for the recipe, Yvonne. Hope your feeling better! So thrilled you liked it Nancie! I made this for dinner tonight and it was absolutely the most wonderful chicken noodle soup that I have ever eaten!! My teenage daughters absolutely loved it and asked me if I could freeze some so that next time they were sick, there would be some ready for them. I make chicken and dumplings quite often and I think I’m going to use this method for the broth. It is so flavorful and just heavenly. Is there a printable recipe without the photos? Sounds like a wonderful recipe. Thanks. Yvonne, I believe your chicken soup reciepe is the closest I’ve read to my mothers. She was a great cook and truly made a unique soup! I’m going to make this soon! My mother kept her noodles separate and it truly makes a difference. I’m not sure about adding potatoes though, she always added a turip and parsnip, to the pot, would you suggest these be added in the beginning and removed? Thank you for your wonderful site, you help make my days! Love your website. Just wanted to ask if anyone else has had a problem with the pale color of the printing when copies are made off your site (of recipes, etc.) ? It’s almost impossible to read them. Any way to solve this? I’m not sure Kay? I don’t think it’s a problem with my site. Try adjusting your settings when you print. Am I the only site that does that? I always add bouillon to my soup as well as gravy. My very fav is Better N Bouillon…what is your fav? I also like Better Thank Boullion! YUMMY! Thank you for sharing,Yvonne, You have given me the perfect added extras my soup needed. I haven’t tried this yet, but my significant other, 81 years old and a wonderful cook, says if you put a little oil in your pot when you boil meat for soup you won’t get any scum. Can’t wait to try your recipe. This is virtually the way I’ve always made chicken soup, according to my Hungarian mother’s recipe. Never used potatoes and probably never will. Always keep the noodles and soup separate, otherwise the noodles expand and soak up all the delicious soup. Very interesting! I never skim off the scum and I never keep my noodles separate. Everything else I do. And my chicken noodle soup is really good…not I’m looking for it to be GREAT! Thanks. 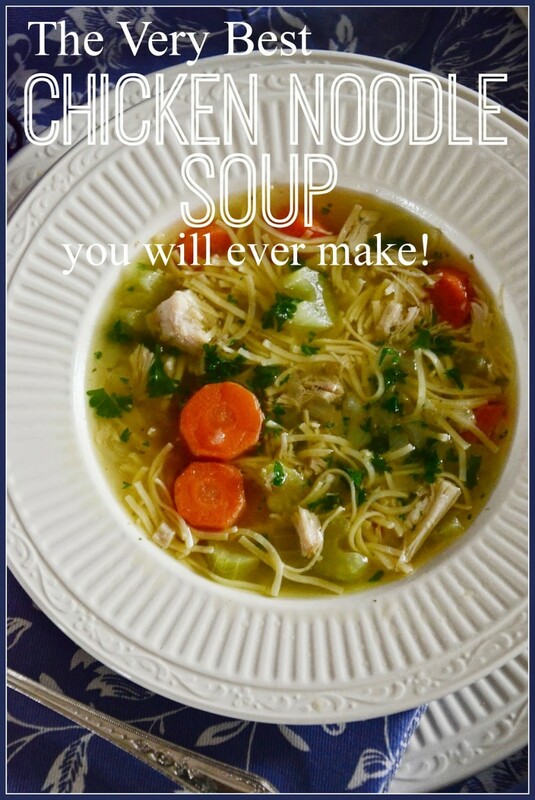 This is a great chicken soup recipe, Yvonne, and a very good tip to keep the noodles and hot soup separate! 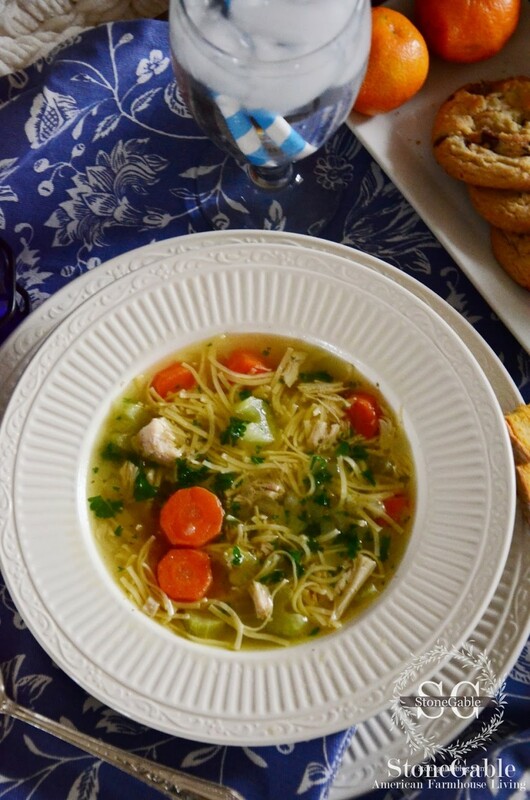 I adore chicken soup, and I make a Greek version called Avgolemno that my mom made when I was growing up–when I feel like I’m coming down with a cold, it’s my go-to soup! I want to try out your recipe now–it looks delish! Yvonne, I made this soup for my husband when he came home from the hospital last week. It was excellent, I will certainly make this one again. 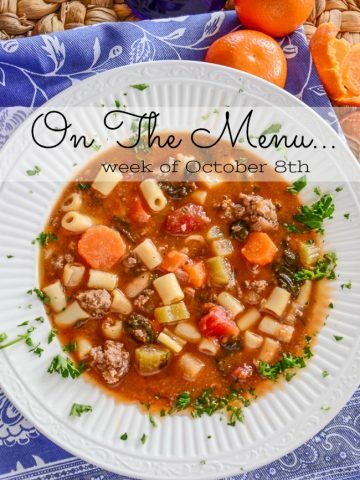 This week I’m trying your taco soup as our weather is cold and snowy. Someone has FINALLY taught me how to make excellent chicken noodle soup…YOU!!! Wow! That took a little time & work, but it was the BEST! We all had two bowls. THANK YOU! It never occurred to me to add new veggies and meat to soup. Thanks! This sounds so good! It would be delicious on a cold winter day! Next time I get a cold I am hauling my big sniffly buttocks over to your house, jumping into your scrumptious bed and gobbling chicken noodle soup. I think I may have to pretend I am sick and just make this. I do want you to know that I have named my 5 extra pounds I seem to have collected Yvonne! Chicken soup is a mainstay at our house. This recipe sounds divine. I love the step by steps and tips.The photos are mouthwatering good! This looks delicious, my mom has a fabulous chicken soup, there is just something about it that is comforting in every way. Oh I wanted to ask you: Can we be best friends? Seriously your post below I just wanted to come over eat and visit so badly. Those cherries and the muffin were calling my name! What a lovely recipe. Your pictures are gorgeous. Thank you for sharing it with us. Have a wonderful Foodie Friday. Yvonne, your chicken soup looks scrumptious! I bet you are an awesome cook! Thanks for stopping by my blog. I’d love to have your recipe for homemade tortillas. I think this will be PERFECT when my husband comes home from the hospital next week. I have tried to make chicken soup several times and it always comes out with minimal flavor, I see the extra steps you have here should take care of that issue. PS: It’s almost 12:30AM here and I have a terrible craving for homemade chicken soup! What a beautiful soup! I’ll have to try it. I have never done it with the noodles separate. I’ll have to try it that way. This is a bit more involved than my old-fashioned chicken soup…but, it sounds and looks delicious and well worth the extra step or 2. Yummy…the photos are perfect! I always add pasta, barley, et al to the bottom of the bowl , ladle the soup on top and then store separately. Otherwise the soup will absorb the stock and you’ll end up with a big pot of mush. This is a great recipe and turorial on great stock. Thanks. That’s right! 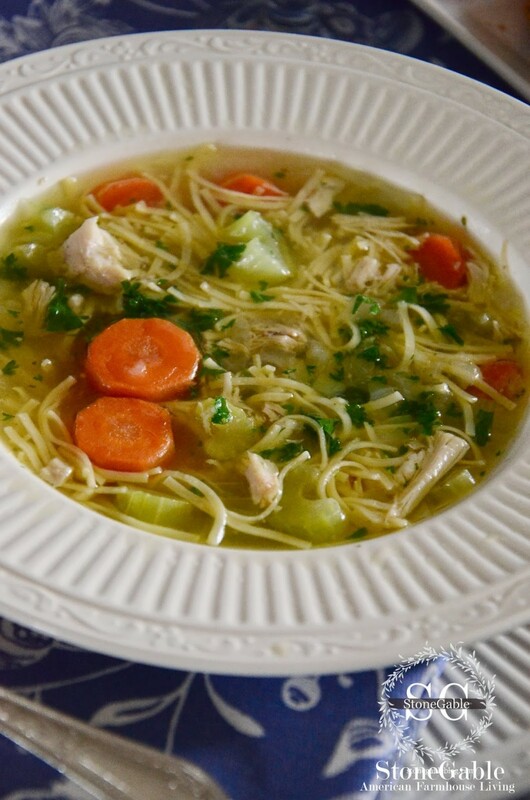 People love my Chicken Noodle Soup… and the not-mushy noodles!